When talking about time we often forget about the mechanisms that make clocks work. 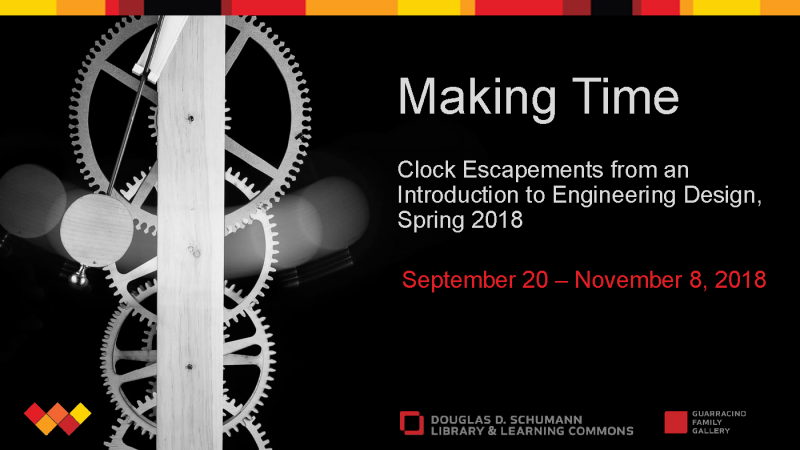 The installation, “Making Time” in the Guarracino Gallery, showcases models of clock escapements created by Freshmen Mechanical Engineering students this past spring. Students worked in groups of four to design and build a working escapement that had to run for a minimum of 60 seconds, three times in a row (no batteries allowed). ENGR1500 is a challenging, team-based hands-on course where students experience the design and engineering process and develop the efficacy and empathy needed to work with others. Also on display is an antique clock from a 1933 WIT Advanced Pattern Making class recently discovered in storage. Each student in the 1933 class was assigned the job of designing and constructing one of the gears needed for a clock mechanism. Every movement of the mechanism could be seen doing its part towards keeping that perfect “WENTWORTH TIME.” The clock is currently being restored by several individuals across campus. The installation is a collaborative effort between the Dept. of Mechanical Engineering, the Dept. of Industrial Design, The Douglas D. Schumann Library, Physical Plant and Accelerate. The exhibit is open to the public and will run until November 8, 2018. Brown, Henry T. Five Hundred and Seven Mechanical Movements, Embracing all those which are most Important in Dynamics, Hydraulics, Hydrostatics, Pneumatics, Steam Engines, Mill and Other Gearing, Presses, Horology, and Miscellaneous Machinery, and Including Many Movements Never before Published and several which have Only Recently Come into Use. Mendham, N.J: Astragal Press, 1995. Denny, Mark. Ingenium: Five Machines that Changed the World. Baltimore: Johns Hopkins University Press, 2007. Dohrn-van Rossum, Gerhard. History of the Hour: Clocks and Modern Temporal Orders. Chicago: University of Chicago Press, 1996. Gleick, James. Time Travel: A History. New York: Pantheon Books, 2016. Gott, J. R. Time Travel in Einstein’s Universe: The Physical Possibilities of Travel through Time. Boston: Houghton Mifflin, 2001. Hawking, Stephen. The Illustrated a Brief History of Time. New York: Bantam Books, 1996. Hiscox, Gardner D. 1800 Mechanical Movements: Devices and Appliances. Mineola, N.Y: Dover Publications, 2007. Kern, Stephen. The Culture of Time and Space, 1880-1918. Cambridge, Mass. : Harvard University Press, 2003. Lightman, Alan P. Einstein’s Dreams. New York: Pantheon Books,1993. Mitchell, David. The Bone Clocks: A Novel. New York: Random House, 2014. Richards, E. G. Mapping Time: The Calendar and its History. New York: Oxford University Press, 1998. Rothschild, Alan, and Ann Rothschild. Make: Inventing a Better Mousetrap: 200 Years of American History in the Amazing World of Patent Models. San Francisco, California: Maker Media, 2015. Rovelli, Carlo. The Order of Time. London: Allen Lane, 2018. Sharratt, Michael. Galileo: Decisive Innovator. Cambridge; New York, NY, USA : Cambridge, University Press, 1996. Taylor, Rod, et al. The Time Machine. [DVD]. Burbank, CA: Warner Home Video, 2000. Wittmann, Marc, and Erik Butler. Felt Time: The Science of how we Experience Time. Cambridge, MA: MIT Press, 2017. Even more clock-related news on WIT website! See pictures of students demonstrating their clocks and clock cookies from the opening reception and read about how the discovery of the wooden clock from the 1930’s continues to inspire students today. Contact libraryexhibits@wit.edu for more information about our exhibit program.